It's no Deadliest Catch, but oyster farming can be a risky business. You're at the mercy of mother nature, and in a blink of an eye, everything can change. When Hurricane Sandy pummeled the Atlantic Seaboard last fall, Forty North Oyster Farm was among the many victims caught in the worst-hit area of New Jersey: Mantoloking. One year later, a group of us New York Oyster Lovers decided to trek down to the farm to see the recovery efforts for ourselves. As Superstorm Sandy made its way up the Eastern coastline last October, Forty North Oyster Farm founder Matt Gregg and his crew raced to submerge the bags of oysters down into Barnegat Bay in effort to protect them from imminent wind and waves. Although they managed to hunker all of the oysters down in time, he couldn't have planned for the chaos that ensued. The destructive path of the hurricane left everything in shambles. Entire houses were washed away. Bridges were broken in two. Boats were strewn and piled impossibly high on top of one another, including Matt's. There was no way of salvaging his boat, and no way getting to the oysters in time to save them. Suffocated by the soft muddy sea floor, the majority (95%) of his first commercially-viable crop died. Ok, this is a sad way to start a story, but I can assure you that it has a much happier ending. Let's rewind for a little bit. Ever since Matt Gregg had began his studies in aquaculture and fisheries science at the University of Rhode Island, he had dreamt of starting his own oyster farm. Matt grew up at the Jersey Shore and obtained extensive seafood experience through working at fish markets and on fishing boats. When he finally got the opportunity to turn his vision into a reality, the market was just beginning to blossom with boutique oyster growers like himself. Knowing the importance of having a good brand, Matt picked "Forty North" for his farm name because it is serendipitously situated along the 40 degrees north latitude line. Well, close enough anyway. 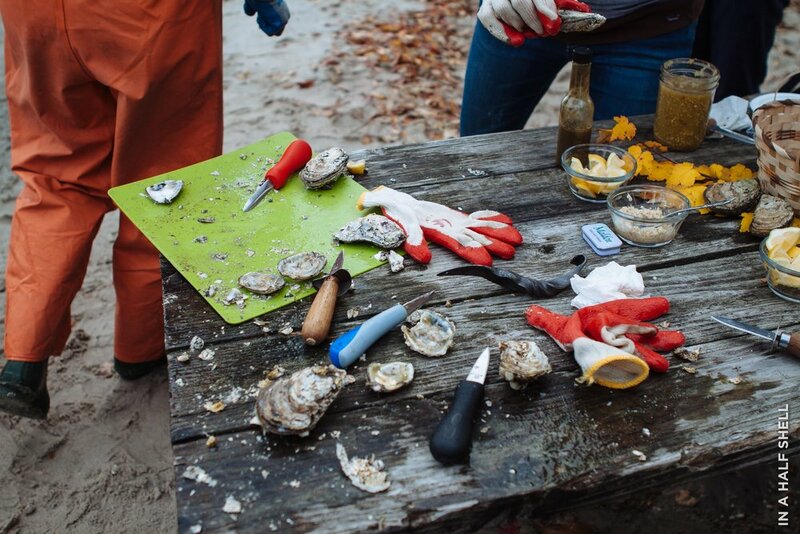 This would be the 3rd oyster farm tour the New York Oyster Lovers has organized. The Blue Island Shellfish Farm tour from 2010 was the very first. Then we visited the Shellfisher Reserve and Widow's Hole in 2011. I also visited Sweet Neck Farm with one other friend in 2012, without the group, but it happens to be one of my favorites. After driving for about an hour and a half drive from Manhattan, we arrived in Mantoloking (the land of beautiful sunsets). Before this, I had never been to the Jersey Shore. But even as a newcomer, I could tell something was amiss. Million dollar homes along the beach were all going through various stages of reconstruction. Some of the beach front lots remained awkwardly empty. We parked at a small dockyard that overlooked Barnegat Bay. Almost everything here looked more-or-less "normal," but we could tell that there were still bits and pieces of abandoned boating equipment left unaccounted for. Our group was approached by three young individuals—about my age—all wearing bright orange waist-high waders. I had met Matt and his college buddy and partner, Scott Lennox, before at Sustainable Seafood Week, and again at the Wine & Food Festival Oyster Bash. This was the first time they really looked like farmers though. Scott's wife, Serafina, was also helping out with the tour today. We went around and did a quick introduction by the docks, but the plan wasn't to hang around here all day. Scott and Serafina took the (new) boat out onto the water and asked the rest of us to rendezvous with them by a secluded lagoon about a mile or two away. Matt followed our group and served as our guide. In order to reach our oyster picnic, we had to hike...awhile. Over the hills and through the woods, under fallen trees and past crazy big spider webs. Other than the occasional wooden plank walkway, there was little sign of Sandy's aftermath in the nature preserve. Nature has a pretty good recovery system. The autumn leaves just passed their prime, but vibrant flecks of red, orange, and yellows could still be spotted between the brown branches. Fifty or twenty minutes later, we came to this beautiful clearing. This narrow lagoon was flanked by an impenetrable wall of trees, marshland, and firm sandy beaches. I'm not 100% sure, but I believe we were strolling through a northern part of the Edwin B. Forsyth National Wildlife Refuge. The Refuge protects over 47,000 acres of New Jersey coastal habitats which is actively managed for migratory birds. The refuge’s location in one of the Atlantic Flyway’s most active flight paths makes it an important link in seasonal bird migration. Flocks of Canadian geese flew overhead now and again. We even spotted a couple Osprey nests close to the farm. Can you imagine that a year ago, this narrow waterway was packed with marooned boats? Scott and Serafina were ready to rock and roll as soon as we got there. The couple are both part-time oyster farmers and full-time teachers for the International High School at LaGuardia Community College. Right now one of their biggest commitments to this business is taking time to make the commute. Having to trek all the way from Queens, NY to Mantoloking, NJ on a regular basis is no small task. As we all approached the picnic table, I noticed an array of shucking knives. The most distinctive one was this rugged, Game of Thrones-like twisted blade. Upon further examination, I recognized it as the handiwork of Carolina Shuckers. "We got it as a wedding gift," explained Scott. These custom shucking knives make quite the gift! Might have to drop that on my own registry somehow. We knew that the oysters we would be slurping today were very special, but didn't know just how special. They were part of the few that actually survived Sandy. Although they didn't look very pretty, they were still perfectly good to eat... assuming you had the skill to open them up. Living out long, unsupervised days in the water had essentially turned this batch rogue. Full of resistance, yet still unexpectedly brittle at times, the shells proved to be a shucker's ultimate test. We all had to use quite a bit of force and patience to pop them open. I think I shucked about half a dozen myself and then began to mooch off of other members who were far more into the challenge. Alongside the oysters, the Forty North gang also brought an interesting treat for us. Out of a little bucket, Matt pulled out a tiny, chubby critter. It was a little brown mud crab! Despite their cuteness, mud crabs are unapologetic squatters. They like to snuggle into oyster bags, which could pose a threat to baby oysters. Being the resourceful bunch, they've decided to try and make use of the uninvited houseguests. Solution: charge rent. Rent = uh, you crab. In a pan. Fried up with a little Creole seasoning and some sesame seeds. Oh my gosh, what a PHENOMENAL snack. I could snack on these babies all day, every day. They were crispy, salty, crabby, and had a little heat. Really addicting stuff. I had the perfect name for them too. Crab Crack. I jokingly said that if they ever decided to use this name, my royalty fee would be free Crab Crack for-ev-er. Well, that's me half joking, and my gluttony being half being serious. While the picnic was in full swing, Matt took four of us out at a time on his boat to check out the farm. There are three families growing shellfish out on the Atlantic in all of New Jersey. Forty North is the youngest and most northernly-based of the farms. Anyone who has farmed oysters know that it's an incredibly labor intensive process. Forty North is no exception, and perhaps even more so than others. Matt currently floats his bags of oysters on long lines, with each line several dozen yards away from one another. This format is quite a bit different than the rack and bag systems used by South Jersey growers. Although the upkeep is a more work, the oysters grow faster because they're closer to the surface of the water -- where the nutrients are. Plus, the sunlight helps keep the shells clean and parasite-free. As a further precaution, mature oysters are dipped in a salt bath for up to 5 minutes to sterilize the exterior. This is only intended to kill off hitchhikers that might be living on or around the shell. I learned that this isn't the same as giving the oysters a "salt finish," which is a process that several growers now do in effort to increase the brininess of their product. Matt hand grades the oysters three to four times a month and estimates that he can produce a retail-ready oyster far faster than other growers—taking about a year or so. We pulled up one of the floating bags to examine the goods more closely. Although the bag wasn't big, Matt estimated that it contained one thousand juvenile oysters. A side project that he hopes to expand next year is growing gracilaria, a type of edible red algae that oysters love to eat. People do as well and you might occasionally run into at Japanese restaurants. Tasty and beneficial to the oysters, it would be a smart investment to ensure the best future for the business and environment. For the rest of the afternoon, our group lounged around the beach and shucked more oysters. The Sandy Survivors that we had were quite briny and bold. The icy liquor went down like an aqua shot. Full of vibrant minerality and fruitiness. Over the course of a few hours, shucking newbies turned into pro's. One of us even managed to break two oyster knives, no doubt because of having unintentional superhuman strength. Note: It wasn't the Game of Thrones one. What's next for Forty North? Matt recently announced a partnership with Chris Cannon, owner of Morristown's Jockey Hollow Bar & Kitchen (scheduled to open April 2014), and is set to supply the new restaurant with his signature Forty North Mantoloking oysters next spring. Although I'm always up for a weekend trip to Morristown to visit friends, I hope that Manhattan will get its own supply... hint, hint. Forty North is such a cool, masculine brand that they will have no trouble getting more business. Although operations are limited now, Matt has plans to construct a floating workstation to streamline workflow. He'll be able to grade and tumble the oysters right at the source. Deeper, tumbled cups = more meat, more texture, more yumminess! The last photo is of Matt's I'm not a playa', I just shuck a lot pose, which also happens to be the tagline on their super cozy hoodie.